The Tamron 17-50mm f/2.8 XR Di II Lens delivers very good image quality in a small, light, fast and affordable package. Add in the very popular focal length range and you have a lens that is just right for many digital SLR camera owners. The early-in-its-lifecycle popularity this lens is enjoying substantiates this claim. Like Canon's EF-S Lenses, The Tamron 17-50 provides an image circle that is large enough for APS-C (1.5x/1.6x FOVCF) sized digital SLRs sensors. Being sized for a smaller-format sensor allows a smaller design to be used. Measuring 2.9 x 3.2" (74 x 82mm)(d x l) and weighing 15.2 oz (430g), the Tamron 17-50 is an ideal size for these smaller digital SLR bodies. It balances and handles very nicely. Build quality is not rugged, but it is solid - very adequate I would say. The included hood is similarly built. The rubber on the zoom ring is grippy, soft and deeply ribbed. The zoom and focus rings turn smoothly. Tamron's rear lens cap only attaches at one position - a bit of a pain since I'm used to Canon's 3 attachment positions. Tamron's excellent center-pinch 67mm front cap more than makes up for this pain - I've considered putting these on my Canon lenses - And many of Sigma's lenses desperately need them. On to more important issues ... The Tamron 17-50mm f/2.8 XR Di II Lens' AF is rather fast, but the high pitch buzz made by the focus motor is deceptive - making the lens sound slower. I found AF accuracy to be quite good with relatively few missed shots (that were not my fault at least). This is an internal-focusing lens - It does not change length during focusing and the front element does not rotate. FTM (Full Time Manual) focusing is not supported. Since the manual focus ring is rather small and in front of the larger focus ring, I did not find the focus ring turning during autofocusing to be much of a problem. It does turn though. The Tamron 17-50's minimum focus distance is 10.6" (0.27m) and provides a respectable .22x magnification factor. Both the zoom and focus rings rotate the opposite direction of Canon's lens rings. A zoom lock switch is provided. The optical quality of the Tamron 17-50mm f/2.8 XR Di II Lens is excellent (especially for the price). I find my images sharp even when wide open at f/2.8 at all focal lengths - I do not hesitate to use this lens at f/2.8. Narrowing the aperture 1 stop or so yields slightly sharper image centers and noticeably better corners as the corners are somewhat soft wide open. If the subject or background is an evenly-shaded solid color, you might notice slight vignetting when the lens is at f/2.8 at the wider focal lengths. Otherwise, vignetting will not be noticeable. Some CA (Chromatic Aberration) can be seen in real life shots, but nothing I would consider objectionable. Flare is very well controlled. Some barrel distortion is visible at the 17mm end. Pincushion distortion becomes visible at 24mm and more noticeable at 35mm before lessening to the 50mm end. Colors seem fine - neutral. The 7-blade aperture produces pleasant out-of-focus highlights. Of course, the first thing I wanted to do with this lens is to compare it with the Canon EF-S 17-55mm f/2.8 IS USM Lens and Sigma 18-50mm f/2.8 EX DC Lens - Both shown along with the Tamron in the above and below pictures. First, the Canon 17-55 IS. This is my at-the-time-of-this-writing always-mounted lens for my Canon 30D. The obvious difference between these lenses is size - as shown in the picture. The Canon is .4" (9.5mm) wider and 1.2"(28.6mm) longer. The weight is noticeably different as well - The Canon weighs 7.6 oz (215g) more than the Tamron. The Canon and Tamron are similarly sharp in the center at all focal lengths. At mid zoom range, the Canon begins showing better edge performance - becoming much better at 50mm. Keep in mind that the Canon did not perform well on the ISO 12233 chart test - It doesn't seem to like closer focus distances. The Tamron 17-50mm f/2.8 XR Di II Lens shows less vignetting than the Canon. The Tamron is more flare-resistant. This Tamron lens' 17mm is wider than this Canon lens' 17mm. Of course, the Canon has 5mm over the Tamron on the long end. The Canon's biggest advantage is the 3-stop image stabilizer that the Tamron 17-50 lacks. If your subject is not moving (or you are), this is a really nice feature. The Canon also features fast, silent USM (Ultrasonic Motor) focusing with FTM focusing. Perhaps the biggest difference between these two lenses is the price. Each individual must determine if the Canon's advantages are enough to justify the very large price differential. 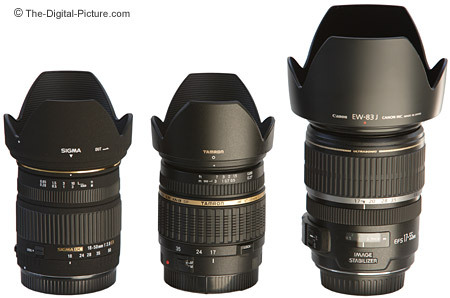 The Sigma 18-50mm f/2.8 EX DC Lens is very, very similar to the Tamron 17-50mm f/2.8 XR Di II Lens. These lenses are more similar than different. They are very similarly sized and shaped. They function very similarly. The differences? The Sigma is less resistant to flare. The Sigma shows more CA. The Tamron is noticeably wider (17mm vs. 18mm - and even wider than the Canon with the same 17mm designation). The Tamron focuses faster, the Sigma focuses more quietly. The Tamron focuses much more accurately - My keeper rate is far higher with the Tamron. My Sigma has a weak left side - For sharpness, the Tamron beats the Sigma easily on the left side, but the Sigma is slightly better on the right. 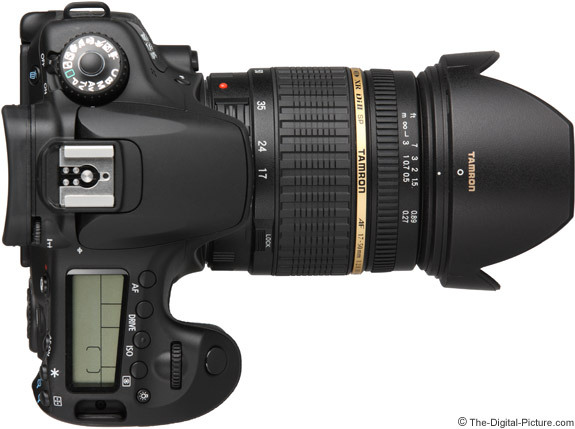 The Sigma rings rotate the Canon direction, the Tamron rings rotate the opposite direction. 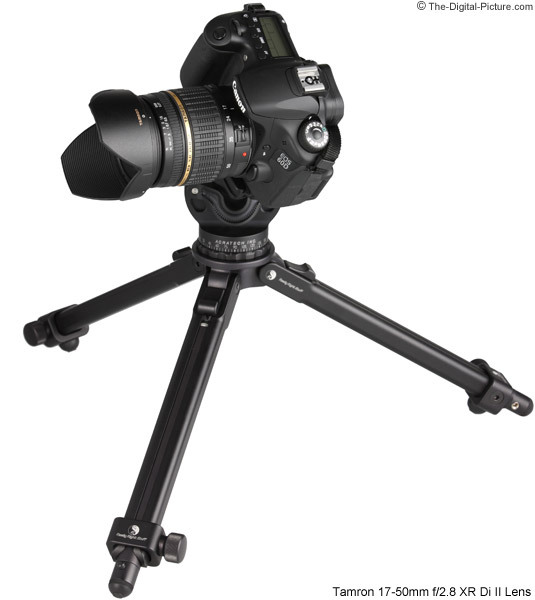 The Sigma is less expensive (but not by much). 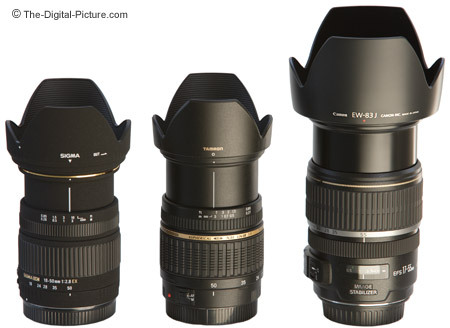 The Sigma's requires its lens hood to be removed to install/remove the lens cap - this is a pain - Plan to buy the Tamron cap if you purchase the Sigma lens. My pick? I'd go with the Tamron 17-50mm f/2.8 XR Di II Lens over the Sigma. Moving on ... Tamron does not provide a pouch/case with this lens. Consider a Lowepro Lens Case 1W as a nice solution to this omission. Click on the image below to compare the Tamron 17-50mm f/2.8 XR Di II Lens to other lens models with and without hoods (opens in new window to save your place in this review). The Tamron 17-50mm f/2.8 XR Di II Lens is available in Canon (reviewed), Nikon and Minolta mounts. My standard disclaimer: You should be aware that there are potential issues with third party lenses. Since Tamron reverse engineers (vs. licenses) manufacturer AF routines, there is always the possibility that a new body might not support an older third party lens. There are examples of this happening in the past. Sometimes a lens can be rechipped to be made compatible, sometimes not. Second, there is the risk of a problem that results in the lens and body manufacturers pointing blame at each other. However, Tamron's 6-year warranty is far superior to Canon's standard 1 year warranty. In the Tamron 17-50, we have a very useful tool. Since it is small and light, we can take it everywhere. Since it is fast (f/2.8), we can use it in low light and indoors - and to stop action. Since it has very good image quality, we can use it for important shots. This list along with a nice general-purpose focal length range fills the requirements of a huge range of photographic opportunities (I'll let you think of them). 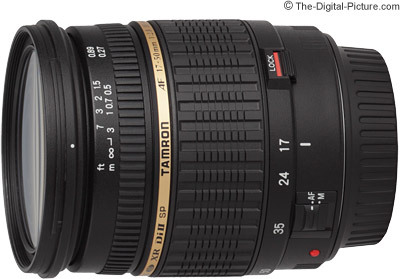 For the price, the Tamron 17-50 is a bargain lens. Review note: Do not confuse the Tamron 17-50mm f/2.8 XR Di II Lens with the Tamron 17-50mm f/2.8 XR Di II VC Lens. The older non-VC lens (this model) has superior image quality.